I completed my apprenticeship at a small garage in Nottinghamshire called Underwood Garage and after my apprenticeship I worked in the business for 5 years. I worked in recovery after the garage as a dedicated recovery agent and the business had contracts with big companies such as AA and the RAC etc. I moved Securicor Vehicle Services in Nottingham for 5 years looking after the fleet of vehicles varying in vans to lorries. In 2011 I was in partnership with my brother and we owned a garage for a number of years and in 2013 I went mobile myself trading as D Pyart Mobile Mechanic. The business caters for all makes/model of vechicle and I tackle all types of repairs. I Had brake pads and discs replace, I couldn't be there for the work but Darren did a good professional job. I have no complaints. Obviously as I wasn't on site communication was limited to "I have finished your good to go" he arrived and completed the task within the parameters that had been arranged. Thanks Darren for a job well done!! 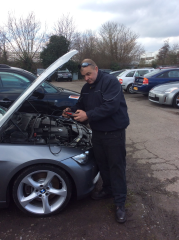 Darren was amazing, arrived on time, great communication, was able to leave him to get on with the job and made sure my car was up and running before he left. Advised me on what to do next. Would recommend. Darren turned up punctually in the agreed time window after texting to advise that he was en route. When he arrived he got straight to work and fixed the replacement brake pads quickly. Was there for less than an hour and left with all the old bits. Darren explained what to expect until they were beded in. Brakes back in full working order and job well done. Thank you Darren. Darren fitted a replacement battery. Punctual, fitted in less than an hour, very efficient. Would recommend. Darren was an absolute star, spoke with him before he arrived due to a concern I had with the vehicle and he delivered. Spent a good while on the phone with me after explaining his findings and what he thought of the car. He also added pictures and gave a solid pre purchase report of the car which helped me make my mind up and also save money. Cannot thank Darren enough and will definitely use again.